The Golf Coast: The Monday Recap: Vegas, baby! If you tuned away from the first half of the AFC Championship game (the Pittsburgh Steelers were leading 24-3 at halftime) for the Bob Hope Classic, then you witnessed a star in the making. 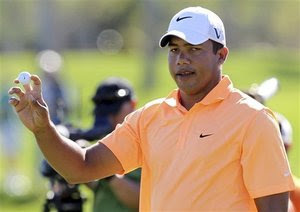 Jhonattan Vegas survived the sudden-death playoff with a Seve Ballesteros-like par to defeat Gary Woodland. Defending champ Bill Haas was eliminated earlier in the playoff. Vegas had cranked his tee shot into the water hazard, and then pulled off a pre-scandal Tiger Woods shot that set up a par-saving effort from about 10 feet behind the pin. After Woodland's missed the green, blasted a bunker shot well past the flag and whiffed on his par chance, Vegas stepped up and did what we've seen Tiger do so many times in the past. He canned it for his first-ever PGA Tour victory in just his fifth event. The Venezuelan is joining a hotbed of talent as the game grows in South America. Multiple Tour winner Camilo Villegas is Colombian and two-time major winner Angel Cabrera hails from Argentina. This is good for the game, because without Tiger's ever-dominating presence, golf needs someone to step up and take hold. With the fiery personality and the humble-yet-competitive demeanor, Vegas is off to a rookie campaign that could find himself in the winner's circle again before 2011 finishes.